Chances are you have been a believer in at least one of these myths. Here is some scientific evidence and common sense to debunk them. Some information has been passed down through the generations at hunting camps and in the pages of magazines. Today’s internet forums cause misinformation to be available to anyone at any time and sometimes it has the ring of truth. Here are six commonly-held beliefs that can be dismantled by using a little common sense and in some cases, new scientific findings. You’ve probably heard variations on this one. Obviously, bucks cannot only travel into the wind otherwise they would be unable to go to food, water and secure cover when the wind is wrong. In some cases I have heard that bucks will put their nose into the wind when fleeing danger. In my experience, bucks are more likely to put distance between themselves and danger no matter what the wind direction. Once they feel the danger is past, they may head for secure cover. Bucks will often travel with a tailwind. I have seen this behavior when they are moving out into an open field to feed. In several cases, a bachelor group of bucks I watched could be seen entering an alfalfa field in early fall each evening, and most times, they approached the field where they could see what was in front of them and smell what was behind them. I have also see, and have scouting camera photos of bucks who prefer to approach their bedding area with a wind at their back. Bucks are individuals and will do what they have learned makes them feel safe. In many cases, that’s quartering into the wind, having the air currents hitting the side of their nose. Many bucks prefer this, but it’s not possible all that often, so they will do what they need to do to feel secure in their movements, using the wind direction in whatever way they can. A giant buck can be produced by the mating of a big buck and a doe with big antler genes. The doe has more to do with producing a giant than the buck’s father. Clearly, this is partially true, but having the genes for big antlers in the father is only a small part of the equation. Bucks pass antler genes onto their doe fawns, which then pass them on to their male offspring. So a big buck is more likely to come from a doe that was descended from a big buck. I have a friend who raises deer and I have learned a lot about antler genetics from him. He tells me that he can predict when a buck will blow up into a giant based on the genetics of the buck fawn’s mother. When he breeds a doe with big antler genes to a buck carrying big antler genes, that’s when the buck fawn is likely to become a giant because he has the genetics to do so from both sides. Also keep in mind that big antlers are the result of age and nutrition. The buck’s mother is responsible for keeping the fawn fed and teaching it to search out quality food and minerals. She is also responsible to teach that buck fawn the survival strategies that will allow him to reach 5-6 years old when his rack can fully develop. So both in the genetics and in the behavior that creates a big antlered buck, a doe has much more responsibility than just the genetics of the buck’s father. This is a long held myth that seems to have trouble dying. I suppose it has so much traction because deer do not respond to hunter orange the way we expect them too. While florescent orange virtually glows to humans, deer seem to have hard time picking it out. This has led many hunters to believe that deer just see black, white and shades of gray. Research began in the 1980’s that seemed to indicate that deer do see some colors. More recent research by the University of Washington and the University of Georgia began to reveal some very specific facts about what deer see. By dissecting a whitetails eyeball and putting it under a high-powered microscope, scientists were able to analyze the color vision in whitetails by looking at the rods and cones on the retina. Rods collect light and cones interpret colors. By analyzing the specific kinds of cones in the deer’s eye, scientists discovered that deer do not see the red end of the spectrum visible to humans, but they see the blue end significantly better than we do. Colors like orange and red are subdued, but greens and blues are very visible to deer. Humans have a UV filter on our eyes, which blocks out much of the blue light that can harm our eyesight over a lifetime. Because deer live much shorter lives, they do not need this filter. Between the lack of a UV filter and the number of cones that interpret blue light, a whitetail deer can see blue about 20 times better than humans can. If you are in a deer’s view wearing an orange vest and blue jeans, the orange would be a subdued color but the blue jeans would be extremely visible. 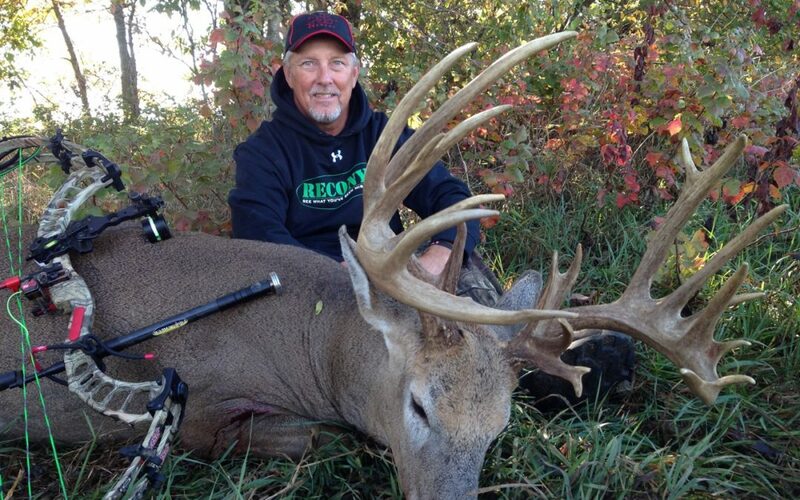 This buck spent most of its time miles away, but each October, it would show up on Rod Owen’s Missouri farm. 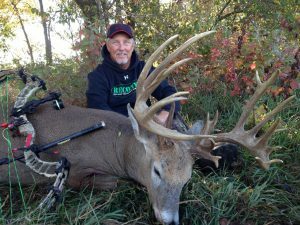 He shot the buck when it arrived in 2015. There’s been plenty of research using telemetry and more recently GPS tracking that seems to indicate that bucks stay in an area they know well, sometimes called a “home range” and many bucks have a very small “core area” where they spend the vast majority of their time. Some studies have shown that some bucks, as they age, tend to decrease their movements and their core area becomes smaller. This sounds logical on the surface, and to the degree that the studies were carried out, it’s hard to argue with good scientific evidence. However, there are some significant problems with these generalizations. While a buck in ideal habitat may have everything he needs close by—secure cover, food and water—not every deer lives in such a utopia. Coyotes and wolves may run deer long distances. Hunting pressure may become so intense that a buck must move. Some bucks seem to have a wanderlust while others have a tendency to hunker down under pressure. It’s easy to over generalize and forget that bucks, like humans are individuals, with individual “personalities.” We would like things to be simple so we could hunt them as if they are all the same, but that’s rarely how things are in the real world. For many years I have done dozens of articles for national magazines on big bucks that have been shot. There are some surprises that come from all that data. Before the advent of scouting cameras, it was rare for a hunter to shoot a big buck of which he had prior knowledge. Most of the time, it was the first time he laid eyes on the giant. Upon interviewing these hunters who shot outsized trophy bucks after the woods became filled with scouting cameras, some things began to take place that changed my opinion. I was surprised how many times I was hit with statements similar to this one, “I would never get a photo of that buck until the first of October then he would just show up on my property.” Or this one, “After I shot the buck, a guy sent me a bunch of photos of the deer that were taken five [or six or seven] miles from where I shot it. He had been hunting it hard on his property. I have become convinced that bucks like to settle into an area where they feel secure but as conditions change—be it food sources, predators, hunting pressure, etc.—they simply pick up and move out. Do they have a secondary home range? It would seem to be so. Could that secondary home range be the natal area where they grew up? Stands to reason that it might be since they spent the first year of their life learning it and all the security it offered. The more we know about home ranges the more we have to learn. Is it better to approach your stand in the dark of the morning or wait until it’s light enough to see? The author believes the latter is better. My bowhunting mentor in the 1970s while I was in high school would always take me to my treestand two hours before daylight in the morning. It would give my scent time to dissipate was his reasoning. I followed this advice for many years. But I started to become concerned that I was filling the area with scent for two hours rather than allowing it to dissipate. Plus, I was spooking a lot of deer on my way to the stand in the darkness. When travelling to and from my stand in the daylight it was much easier to use available cover to avoid being seen. Could it be old Jim was wrong about this? I have started entering my stand site at first light, when I can see to make a quieter approach without artificial lighting. I can avoid stepping on noisy ground cover, and if I see a deer on the way in, I can stop and avoid spooking it. I often move to within 75 yards or so of my stand site in the dark, then wait until I have just enough light to close the final distance with much more stealth. Here’s another one where science tells a small part of the story and has misled many hunters. 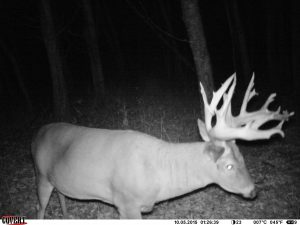 There have been several studies done by placing scouting cameras at scrapes and analyzing the data on the times the scrapes were visited by bucks and does. Each of these studies showed that the photos of deer taken at scrapes were primarily at night, in fact, in most studies, 80 percent of the photos were taken under the cover of darkness. Bucks will avoid exposing themselves to approach a scrape during the daylight unless they smell something that causes them to hook around and come right to it. 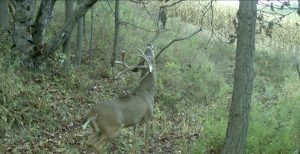 These studies miss one important component to the way bucks visit scrapes. During darkness, bucks feel comfortable strolling about checking scrapes as they go. They walk up to a scrape, take a sniff while getting their photo taken and then move on. Not so during the daylight. Many primary scrapes—the ones that are likely to get checked several times by multiple bucks—are on the edge of fields adjacent to an open area such as a crop field or clearing. These primary scrapes will have an overhanging branch and be the center of attention until the chasing and breeding begins in earnest. Bucks do not like to expose themselves to those open areas during the daylight, but during the last week in October and the first few days in November, when the scrapes are being checked, and the bucks are on their feet at any hour of the day, will they just abandon those scrapes until night time? I don’t think so. 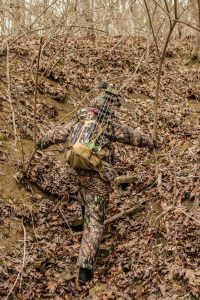 Whenever possible they will stay 20-40 yards back in the cover and scent-check the scrape from downwind. They will only hook around and approach the scrape if something compelling hits their nose. Only then do they get their photo taken. I have seen this behavior in person often enough to believe it is common. So there are my opinions on why these six beliefs are myths. You are free to disagree. Comment below if you have something to add.